The main seating bowl PA at the New Meadowlands stadium is a large distributed JBL system—one of the largest distributed audio systems in a modern NFL building. 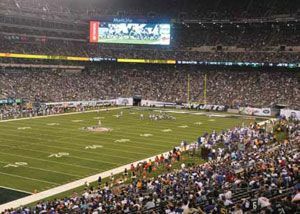 NEW RUTHERFORD, NJ—With a seating capacity of 82,500, New Meadowlands is the first stadium purposebuilt to be home to two different NFL teams, the Giants and the Jets. In an appropriate technological parallel, the facility’s converged network also brings AV, broadcast, digital signage, and entertainment together in a unified package. The stadium is equipped with four massive Daktronics HD video display scoreboards. More than 2,200 HD video displays powered by Cisco StadiumVision were installed throughout the facility to provide fans with access to the game virtually anywhere. Cisco partnered with Verizon to provide 34 channels of customized HD content that gives fans the opportunity to view multiple games and other content at the same time in select areas of the facility. In addition, Verizon installed a comprehensive wireless network to accommodate fan access to sports and entertainment content, and the Giants and Jets are working with Verizon Wireless to offer fans interactive mobile apps. The tremendous number of loudspeakers installed helped assure uniformity of sound throughout the seating areas and concourses, but the outdoor venue’s architecture made loudspeaker placement a challenge. Particular care was taken in optimization of the JBL AL6115 low-frequency module, mounted behind each PD5322/64 enclosure in the lower sections and configured as an end-fired array to reduce the lowfrequency energy affecting the nearby luxury suites.